A view from Mumbles Hill to the Lighthouse on Mumbles Head . A 17m high Lighthouse , built in 1794. 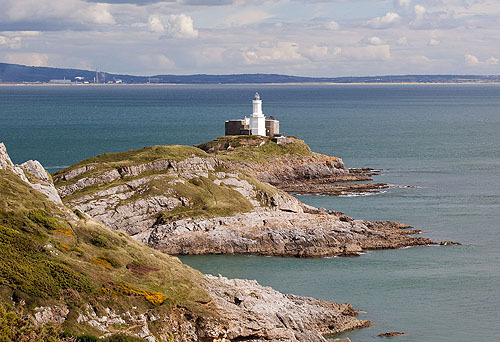 The Mumbles Lighthouse originally displayed two open coal fire lights , one above the other to distinguish it from St Ann's Head Lighthouse which had two lights on separate towers and Flatholm Lighthouse with one light. The current Lights have a range of 15 n. miles - with 4 white flashes every 20 seconds. The fog horn has a 2 n.mile range - with 3 blasts every 60 seconds.